Ellen Page, in her coming out speech, nailed it when she said, “…this world would be a whole lot better if we just made an effort to be less horrible to each other”. This reminded me of a game I had long forgotten. A few years ago, I was sitting on a bench in Laguna Beach, watching people meandering by. I had been struggling with accepting that I had to share the world with people who I (self-righteously) frankly couldn’t stand. As I painfully rued this reality, an epiphany came to me in the form of a challenge. I looked away from the ocean and caught the eye of the first person I saw. An older gentleman in frumpy clothes and a clearly painful gait. The following question immediately came to mind. In all honesty, it took more than a few seconds. I had to hunt for something that I could love and appreciate about this stranger. “I love his willingness to walk with his family even though he is struggling to do so.” As my gaze lingered a bit longer, I saw his interaction with his family and sensed that they truly adored this man. My appreciation for him shot up a few more points. He had an adorable laugh. A courageous, unselfish spirit. I sensed all that in 15 seconds. So I looked at the next person and the one after that. For each person who passed by, as quickly as I could do so, I silently identified what i found beautiful, striking or impressive about that person. And then she came by. I won’t describe her, there is no need. Every part of her seemed to be in physical, emotional and mental chaos. She looked frozen, numb, angry. I sensed she lived her life in constant defense-mode. But this challenge doesn’t have a “pass” option. The point is to find something beautiful in every single person. With this woman, I found it in her courage. I appreciate that it clearly took courage for her to face the world, to go out and subject herself to the judgemental eyes of other people. But on that day, I wasn’t one of those people. I smiled at her as she went by; hopefully in a compassionate way that showed that I acknowledged her and accepted her. And out of the corner of her eye, I think she saw me. 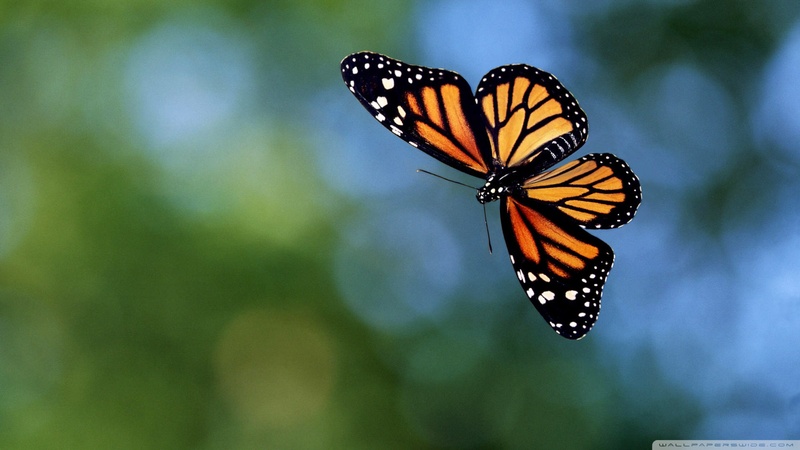 The flap of a butterfly wing can change the weather in the world. Sometimes I wonder if a smile from a stranger can have the butterfly effect on their soul. For her sake, I hope it does. How would her life be different if everywhere she went, people were less horrible to her? It would be healing to her – physically, mentally, and emotionally. But the real question is this: How would MY life be different if I were less horrible to everyone else? We all have our preferred method of “horrible”. Are we judgmental, cold, manipulative, gossipy, catty, taunting, passive-aggressive, emotionally abusive, insensitive, selfish, inconsiderate, prejudiced, downright rude, narrow-minded, self-righteous, condescending… need I go on? Instead of trying to stop doing all those things, START doing something new. It’s the easiest way to make a massive change in your life. When you start a new practice, you will find the old tendencies falling away. Each time we find something beautiful in another, the butterfly wings are creating magical transformations – both in how we connect with one another and in healing our own shadows. Posted on February 16, 2014, in Life and tagged beautiful, beauty, bullying, butterfly, butterfly effect, catty, cold, condescending, downright rude, ellen page, emotionally abusive, gossipy, horrible, inconsiderate, insensitive, judgmental, kindness, laguna beach, manipulative, narrow-minded, passive-aggressive, prejudiced, self-righteous, selfish, taunting. Bookmark the permalink. 2 Comments. Simply lovely. I love the way you think!